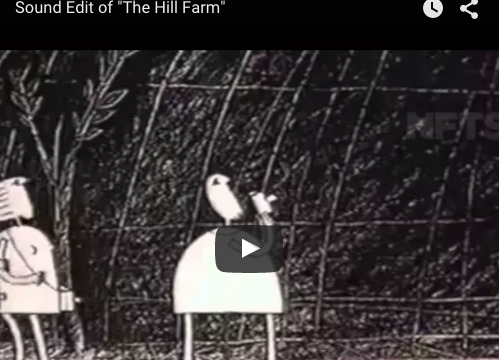 I’ve been working on creating the sound effects for an extract of footage from “The Hill Farm” by Mark Baker. It has been very enjoyable!! All the sound effects are created by myself. I found the beautiful music on line and have credited it accordingly at the end of the extract. 1: yawn – record of Brenda yawning. 3: walking on gravel: the sound of crinkling baking paper. 5: character collapses in fright: record of Brenda’s voice and thud is hammer on book cover. 7: people running from cave: 3 audio tracts recorded by Brenda and layered to give the effect of different people. 8: sound of beast walking: recording of banging on empty plastic coal bunker – mike in coalbunker. 10: chuckle of beast: record of Brenda chuckling. All the recording was done using the Audio facility in Adobe Premier Pro.